Getting in shape is one of the most common New Year’s resolutions in America. Despite this, obesity rates in the U.S. continue to climb. While it’s never easy to hit your fitness goals, some cities make it easier than others. These cities tend to be walkable, have healthy eating options and plenty of places to get a workout in. Below we look at the most fitness-friendly cities to see where residents are most well placed to accomplish their new year’s resolutions. In order to find the most fitness friendly places in the U.S., SmartAsset looked at data for 340 cities. We looked at metrics like the percent of people walking or biking to work, the number of fitness jobs in the area, the cost of hiring a personal fitness instructor, the number of fitness establishments and the prevalence of fast food restaurants. Check out our data and methodology below to see where we got our data and how we put it together. 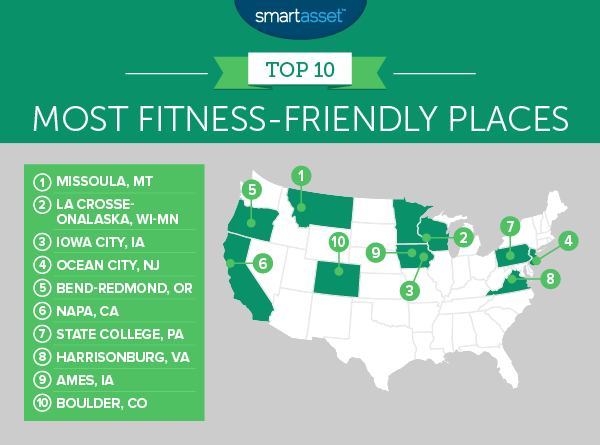 This is SmartAsset’s fourth annual study of the most fitness-friendly places in America. Read the 2017 version here. It’s harder in the South – If you live in the South and are trying to get in shape, you may face an uphill battle. States like Texas and Georgia are especially unfriendly to residents trying to get in shape. Six cities that rank in the bottom 15 are in Texas and three are in Georgia. Metros in the South tend to be riddled with fast food places and residents have to drive everywhere. Consistency – Seven of last year’s top 10 finished in the top 10 again. 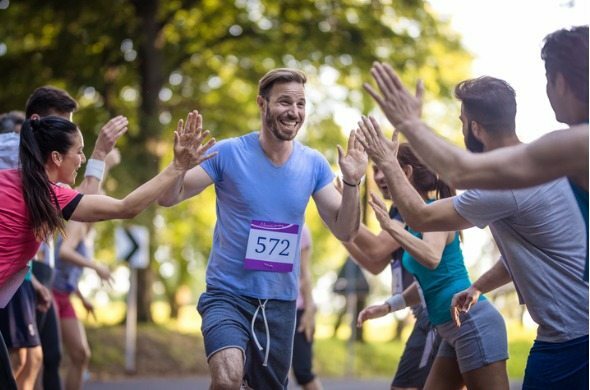 Missoula, Montana in particular continues to be a great place to get in shape having finished in the top spot for three years running. Sometimes all it takes to get in shape is a simple change of habit. For example, by skipping the car and walking or biking to work you can adopt a healthier lifestyle. Missoula ranks highly because it allows its residents to do just that. Around one in 11 residents walk or bike to work here, a top 10 rate. It should also be easy to find places to work out around Missoula as it has 123 fitness businesses per 10,000 establishments. This metro area jumped up five spots from last year to finish second. The area improved its scores in both the number of fitness professionals per 10,000 workers and the number of fitness establishments per 10,000 establishments. In fact, La Crosse-Onalaska now has the fifth-highest density of fitness professionals in our study. However, if you want to keep your checking account looking healthy you may want to stick to creating your own workout plan. Personal trainers here earn over $15 per hour. Iowa City jumped up all the way from 15th into this year’s top 10. The reason we rate this metro area so highly is because of how many residents decide to walk or bike to work. Around 11% of residents decide to walk or bike to work, the fifth-highest rate in our study. Another plus to living in Iowa City is that, relative to other metros, you should be surrounded by relatively healthy food. Or at least options other than fast food. Only 34% of restaurants in Iowa City are categorized as fast food, a rate that beats 90% of other cities. One of the biggest hurdles to staying in shape is making sure you are consistently going to the gym. Sometimes people don’t go to the gym because it is too crowded or because it is too far away. Most residents in Ocean City shouldn’t have those excuses. According to data from the Census Bureau, there are over 118 fitness establishments per 10,000 establishments in Ocean City. This city also has relatively little fast food to tempt you into bad food decisions. If you do need a personal trainer and live in Ocean City, get ready to dip into your savings account. Ocean City’s personal trainers earn just under $21 per hour. Last year’s fourth place finisher drops one spot. This metro has a large number of fitness professionals and fitness establishments, so whatever your fitness needs you should find someone here who can help. However getting that help may get expensive. BLS data shows personal trainers earn $19.44 per hour, a below average score for this study. Additionally only 4% of commuters in Bend-Redmond walk or bike to work which is the worst score in the top 10. While the wine in Napa may not be helping you stay in shape, the food probably is. Only 31% of restaurants around Napa are considered fast food. If you want to find some professional help to get you into shape, Napa has plenty of options. This metro area has over 45 fitness professionals per 10,000 workers. Like most things in Napa, and in California in general, personal training is pricey. Personal trainers in Napa earn over $25 per hour, one of the highest rates in the study. State College is a young, able-bodied college town where large portions of its residents choose to go to work on foot or bike. In total over 11% of residents here take the active route to getting to work. This Pennsylvania metro area also has the 11th-most fitness establishments per 10,000 establisments in our study. This means hopefully less crowded gyms and plenty of space to work out. If you want to get in shape, sometimes you need a little extra motivation. By hiring a fitness professional to help you meet your fitness goals, you are both getting helpful advice and also committing to going to the gym. If you have your personal trainer waiting for you, it’s a little harder to skip the gym in favor of sitting on the couch watching Netflix! But while Harrisonburg has plenty of fitness professionals to choose from (third-most per capita in our study) they can be expensive. BLS data shows the average personal trainer earns $20 per hour here. Last year’s number two has taken a tumble down the rankings. But Ames is still a great place to get in shape. If you want to walk or bike to work, and take a holistic approach to your fitness, that is possible in Ames. You would be joined by around 9% of workers in Ames. If you want to hire a personal trainer and try and hit your 2018 new year’s resolution by February, that is also possible in Ames. This metro area beats 80% of metro areas in the study when it comes to the relative number of fitness establishments and fitness professionals. However, if you are the type who loves fast food, Ames may be best avoided as 44% of restaurants are classified as fast food. Our list ends in another college town, this time Boulder, last year’s eighth place finisher. This metro scores in the top 15 in both the percent of residents who walk or bike to work and the number of fitness professionals per 10,000 residents. In fact Boulder even has a top 25 score in the number of fitness businesses. But no city is perfect. Boulder ranks 337 out of 340 cities when it comes to the affordability of professional fitness help. Percent of residents who walk or bike to work. Data comes from the Census Bureau’s 2015 5-year American Community Survey. Concentration of fitness professionals. This is the number of fitness professionals per 10,000 workers. Our list of fitness professionals includes dietitians and nutritionists, recreational therapists, athletic trainers and fitness trainers and aerobics instructors. Concentration of fitness establishments. This is the number of fitness establishments per 10,000 establishments. Our list of fitness establishments includes sporting goods stores and fitness and recreational sports centers. Data comes from the Census Bureau’s 2015 metro area business patterns survey. Concentration of fast food restaurants. This is the percent of restaurants which are fast food. Data comes from the Census Bureau’s 2015 metro area business patterns survey. Average hourly wage of personal trainers. Data comes from the Bureau of Labor Statistics and is for 2016. We ranked each city in each metric. Then we found each city’s average ranking, giving a half weight to the concentration of fast food restaurants and average hourly wage of personal trainers. Using this average ranking, we created our final score. The city with the best average ranking received a 100 and the city with the lowest average ranking received a 0. Did you know that some health insurance plans offer gym reimbursement? Make sure you check with your health insurance provider to see what deals they offer. It’s a good idea to try out different gyms before you commit to joining one. Some gyms are better for your wallet but come with different amenities, so it is a good idea to try them out first. You could also decide to skip the gym entirely. If you have enough space in your home you may want to buy exercise equipment and skip the monthly fee. And if you’re on a tight budget, remember running outside is always free.